Goodbye pencil skirts, and hello billowy fabric! Today’s fashion forecast calls for a flowing skirt that channels a boho vibe, not a classic, conservative office style—but how do you sport the style and make it your own? Paired with bodysuits, off-the-shoulder tops, sweatshirts, and tanks, the loose design looks ultra-high fashion. After all, when you step out onto the street, billowy skirts tend to take flight in the wind, a la Marilyn Monroe. Before the trend graced the runway of some of today’s top designers, it was quite popular back in the 1940s. 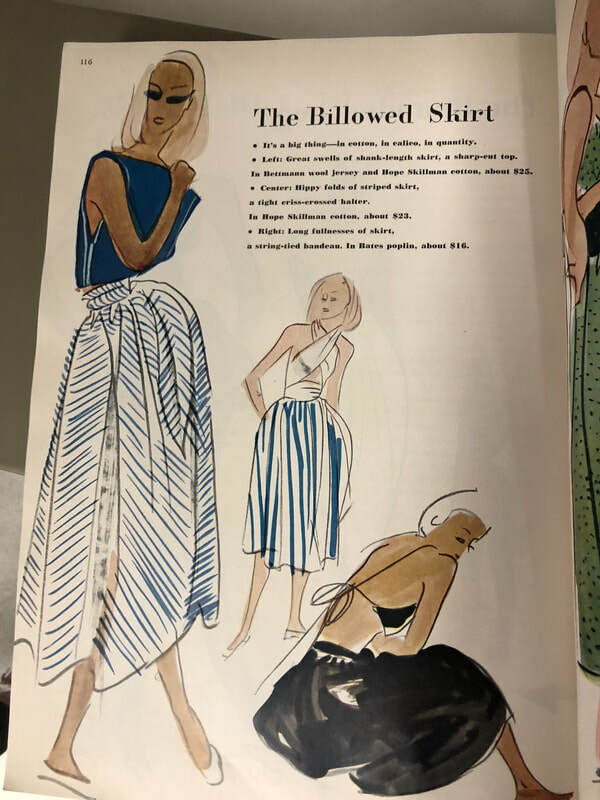 In fact, Harper’s Bazaar’s December 1945 issue actually featured the billowed skirt as a seaside trend of the moment, sketching the design in ocean blue hues. Many nautical dresses also had billowy bottoms, since it offered a flirty, feminine vibe that represented women’s universal pursuit of liberty through fashion. Fast forward to the 21st Century, billowy styles are back and showing up in full force this fall. Chanel’s Fall 2018 Ready-to-Wear Collection featured a variety of billowed skirts in bold prints and clever details. One of the most memorable examples was a floral skirt a model sported that undulated behind her as she walked the runway. The design was paired with an intricately-sewn top in the matching hue and metallic gold gloves. Dior, Chanel’s top competitor, picked up on the trend as well at its Fall 2018 Ready-to-Wear runway show. Except this designer took a different approach in highlighting the trend, sending models down in a multi-printed, billowed skirts with ruffle detailing on the hem. Paired with tinted sunglasses and a newsboy cap, the look offered more of an edgy vibe as opposed to Chanel’s feminine frocks. In Stella McCartney’s Fall 2018 Ready-to-Wear Collection, the brand showed a billowy look in a more muted hue than Dior and Chanel. A pastel pink set looked elegant and timeless, even when paired with earthy brown slip-on sneakers. Incorporating the trend in your everyday wardrobe doesn’t require you to scout out a billowy skirt as bold as Chanel’s--it's called high-fashion, after all. Pair billowed clothing with pieces in a similar or matching hue to create a cohesive look. Who knows...your new closet staple piece may just inspire a new office uniform.